The Most Complete and Accurate Information on Deer Antler Velvet. In Asian countries, deer velvet is distributed in traditional, local medicine shops. Asian consumers obtain loose, dried velvet slices along with complementary herbs put together by their medical practitioner. The combination of herbs and their quantities are geared towards a client’s individual diagnosis. Asian consumers prefer this method of purchasing deer antler velvet as they want to have the verbal reassurance of quality from the seller. In Western countries, deer antler velvet is predominantly obtained through retail stores and online in prepackaged capsule, powder or extract form. There are literally thousands of deer antler velvet products on the worldwide marketplace. Here is our list of the very best deer antler velvet manufacturers and their products. Antler Farms is a New Zealand producer of high end, exceptional quality deer antler velvet products. New Zealand is world’s biggest producer of farmed velvet and the leader in deer antler velvet research. The main deer species farmed in New Zealand is red deer (cervus elaphus). The herds are typically raised in large, outdoor, grassy areas spanning many acres. By law, no growth hormones or antibiotics can be legally injected into the deer as part of routine husbandry (exceptions for antibiotics are made with sick animals). Because of strict government oversight surrounding New Zealand’s deer industry, the material coming out the country has a consistent quality and dependable supply. Deer antler velvet produced in China, Korea or Russia is not as trusted or reliable. Antler Farms stands out in the industry due to its rigorous standard for material sourcing and innovative processing. Alcohol free and heat free processing. Antler Farms extracts are prepared using proprietary processing methods that do not include alcohol or heat. Heat, even for short periods of time or at lower temperatures, will cause some degradation of the material. Disclosed growth factor content. Antler Farms extracts have a strong, concentrated 75:1 extract ratio (i.e. 75 grams of raw material is required to make 1 gram of extract). The product label discloses the growth factor content (25,000 ng/100,000 ng). Most deer antler extracts do not reveal the growth factor content on their nutritional panels, only listing the amount of extract, which itself does not infer potency. The true potency of an extract can be assumed, but not ascertained, without knowing the growth factor content. Liposomal delivery. Antler Farms extracts are delivered via liposomal action. The nutrients are contained inside tiny particles which are easier for the body to absorb and allows more to get to the target area of the body. 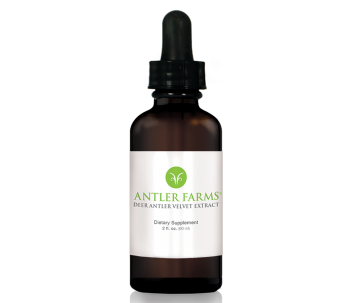 Antler Farms deer antler velvet extracts can be purchased here. Exclusion of antler bases. Whole velvet antler sticks have four sections (tip, upper, mid and base). Antler Farms excludes antler bases from their product, which increases the density of beneficial, sought-after nutrients. Generally from the tip of the antler toward the base the ash content increases, lipid content decreases and protein content decreases. Freeze dried processing. Antler Farms utilizes freeze drying rather than heat drying to prepare their deer antler velvet. Freeze drying has the benefit of preserving the active nutrients while heat, even for short periods of time or at lower temperatures, will cause some degradation of the material. This product is the market’s only raw, whole food form of deer antler velvet. 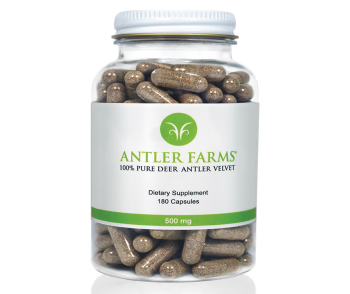 Antler Farms deer antler velvet capsules can be purchased here. Dragon Herbs is a company that was founded by America herbalist Ron Teeguarden and his wife Yanlin. Ron is a practitioner of holistic Asian health and a specialist in Chinese tonic herbs. Dragon Herbs offers a wide range of herbs which are sourced directly from their original sources in China. The company has control over the process from the source to the manufacturing to final production. Chinese deer are hand raised by humans in enclosed pens, rather than free grazed on pasture. Made from antler tips. Dragon Herbs deer antler drops are made entirely of deer antler tips (the last inch of the antler), which contain the most biologically active constituents of the antler. This increases the potency and effectiveness of the extract over forms of deer antler extract that use whole stick antler. 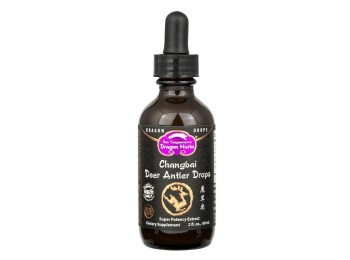 Deer antler drops are extracted in a traditional manner using alcohol and have a 4:1 concentration. From Sika deer. Dragon Herbs drops are made from a small preserve of protected Sika deer (cervus nippon). Sika are small spotted deer that are natural to northeastern Asia. This kind of deer has been revered in Asia for its deer antler since ancient times. The Sika deer are farmed in Changbai, China, and are certified by the Chinese Ministry of Health to be clean and safe. Dragon Herbs deer antler drops can be purchased here. Plum Flower is a large Chinese manufacturer of herbs used in Traditional Chinese Medicine. 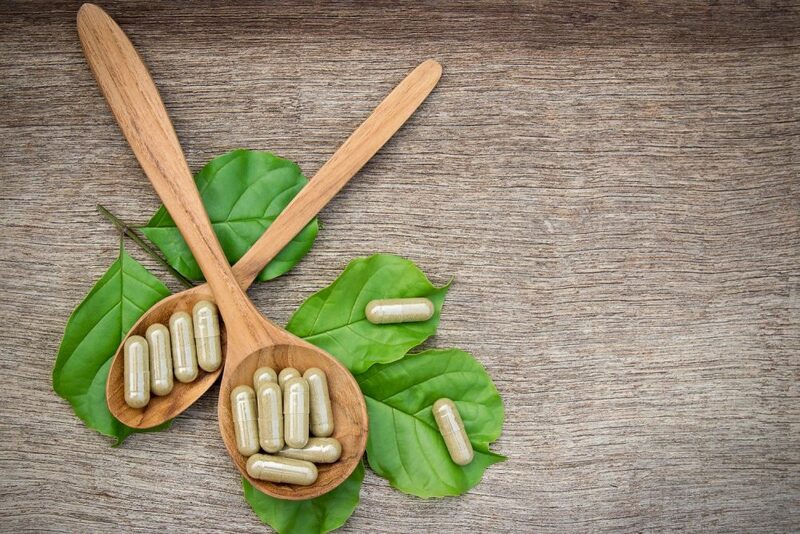 Their products are popular among professional herbalists and those customers who have the experience and knowledge necessary to safely prepare their own formulas. They are not intended for normal consumer use, and thereby do not include usage information. Caution needs to exercised when using Plum Flower products. Traditional, but modern processing. Plum Flower follows strict traditional guidelines for the correct preparation of herbs. Deer antler velvet is prepared with updated equipment and procedures to ensure stable and uniform quality. The deer antler velvet is sterilized with heat or high-pressure alcohol steam. Then it is distilled under low temperature and spray dried to form a fine powder. Concentrated powder. Plum Flower produces deer antler velvet extract powder in a concentrated form. The powders are concentrated at a level of 5:1 (i.e. 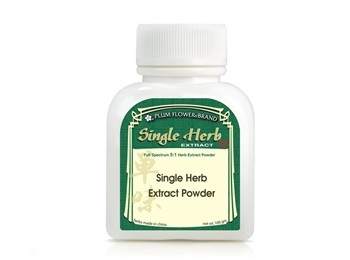 1 gram of 5:1 extract powder is equivalent to 5 grams of raw powder). Plum Flower deer antler velvet extract powder can be purchased here. The best choices for quality deer antler velvet products are made by reputable, established companies. Be wary of other deer antler velvet products, especially low priced products, as they will likely contain very low amounts of deer antler velvet, low quality deer antler velvet, or even no deer antler velvet at all. Unfortunately the growing interest of deer antler velvet from natural health advocates, alternative medicine practitioners and performance athletes has attracted companies whose only intention is to profit off of uneducated consumers. Real deer antler velvet products are always expensive because the raw material is highly sought after on the worldwide market.